This post is part of a series on the theme of women and protest. The full series is collected under the tag “Revolting Women”. Following on from Steve’s post yesterday about martial arts and the upper echelons of the suffragette movement, welcome back to guest blogger Libby from TreasuryIslands, in the first of two guest posts. Monday 8th March, 1907. The Ladies’ Gallery of the House of Commons is closed as a precaution as the Dickinson bill receives its second reading. The bill, which would see the enfranchisement of around a million propertied women in the UK, is talked out. In protest, the Women’s Social and Political Union (WSPU) decide to march on Westminster. Twelve days later, several hundred women gather to make their discontent known. Among them are local WSPU groups from Yorkshire and Lancashire, a ‘clog and shawl brigade’ of workers from cotton and worsted mills. The House of Commons is defended by more than 500 police. Seventy-five women are arrested. 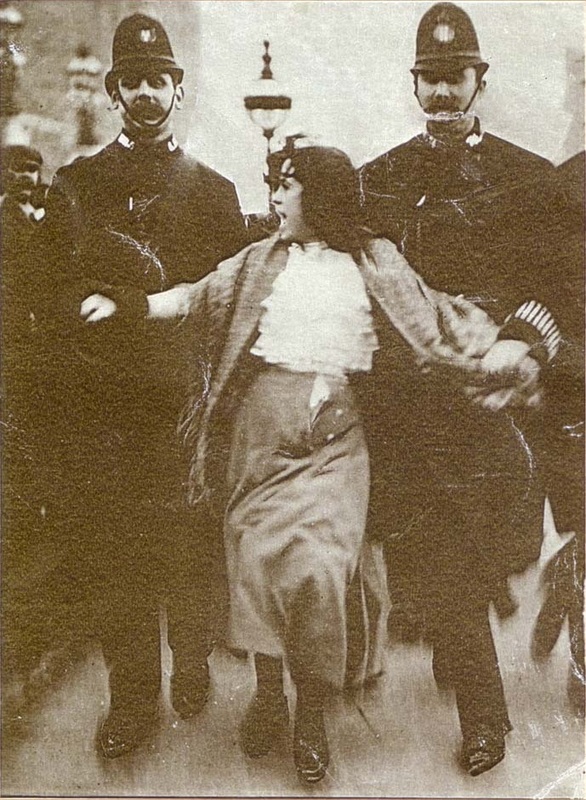 The following day a photograph appears on the front page of the Daily Mirror of a young woman, flanked by a pair of police officers. Her skirts and shawl in disarray, her hair wild. She appears to be shouting. Her name is Dora Thewlis, a weaver in a Huddersfield mill. She is just sixteen years old. The child cannot be a delegate or anything else. She doesn’t know what she’s doing. You ought to be at school. It is really a shocking thing that you should be brought up to London to be turned loose […]. Where is your Mother? Here is a young girl of seventeen [in fact she is 16] enticed from her home in Yorkshire and let loose in the streets of London to come into collision with the police. It is disgraceful for everybody concerned. First, men like Horace Smith had not the remotest understanding of child labour, let alone the half-time system widespread in the north. His pontification is tragically revealing about the dimensions of inequality. Second, Smith saw ‘young girls’ and ‘London streets’ as having only one possible reading: moral looseness and semi-prostitution. The word ‘entice’ says it all: Dora had been ‘enticed’ down onto the London streets, in her turn to ‘entice’ innocent young men. […] It remained unthinkable for respectable women to demand citizenship by taking to the streets. successfully, to prevent women entering their profession. As an active member of the Independent Labour Party (ILP), who (according to her mother) had since the age of seven, ‘been a diligent reader of the newspapers, [able to] hold her own in debate on politics (Liddington, p 112), Thewlis was well aware of the inequity of society. For the mill workers of Yorkshire and Lancashire, the failures of capitalism were apparent in the hierarchies of the factories. Mill workers were encouraged by their physical environment to isolate themselves by specialism so that ordinary labourers were looked down upon by spinners and sorters, who in turn were sniffed at by the overseers. This segregation, inevitably, extended outside the factory walls, and for workers of different grades to socialise together was unusual. Outside of large factories small firms too held a paternalistic sway over the lives of their workers, fighting constantly to keep down costs and able to ruin the reputation of any worker that refused to toe the line. The ILP sought a number of economic reforms, summarised by Robert Haggard in this book as “an eight hour working day; the abolition of overtime and piecework; the prohibition of the employment of children; public provision for the sick, the disabled, the aged, widows and orphans [and] free, non-sectarian primary, secondary and university education”, as well as a fair minimum wage. The party was evangelical in its belief that the world could be a better place for everyone through socialism. Ardently supporting the ILP, it was not surprising that Dora Thewlis would embrace suffrage with the same fervour, and she joined the Huddersfield branch of the WSPU as a founding member in December 1906. So it was that Thewlis found herself arrested and remanded to Holloway. Once in prison, Thewlis was bathed, given a prison number and uniform and separated from her comrades. Inside the once belligerent, combative Thewlis grew lonely and wan, convinced she had been forgotten. Though she remained in Holloway only six days, Thelwis became a cause célèbre. Christened the ‘Baby Suffragette’ by the Daily Mirror, she was dogged by reporters at both ends of her journey back to Huddersfield. Portentously, no members of the local WSPU came to meet her. Smith had, opening her up to ridicule both in the press and from her fellow suffragists. There was a feeling of alienation among the Huddersfield suffragists who felt attention had been drawn away from their cause by disputes over Thewlis’ age and Mr Smith’s comments about “enticement”. By August of 1907 the image of young Thewlis being arrested had been turned into a picture postcard, and, though Dora herself had remained largely quiet on the matter, relations between the Thewlis women and the WSPU had become strained. It’s difficult to know exactly what caused the tension, though Dora’s mother Eliza, who tended to claim a greater role than she ought in the branch dealings, undoubtedly did not help the situation. A letter was dispatched to the Thewlis home asking Eliza Thewlis to work agreeably or resign from the branch. All Thewlis and her cohorts wanted was to be granted the right to vote. The had to abide by the law of the land, they argued, so why could they not have a hand in creating it? It is worth noting that, despite the WSPU’s significant working class membership, they did not fight for universal suffrage, but the right for women to vote on the same terms as men. It was, in the words of one nameless critic, “not votes for women, but votes for ladies”; only a meagre few would meet the property qualification required by law. Dora Thewlis, with her socialist zeal and youthful indignation, would not be one of those women. the first hunger strikes taking place the following year. In 1912 they began attacking the contents of post boxes, and the campaign of violence and arson escalated. The following year Emily Davison became a martyr to the cause, dying following head injuries sustained in what is likely to have been an attempt to grab the bridle of the King’s horse at the Derby. It is frequently argued that such militancy did more to harm the suffragist cause than to progress it, and that the constitutional actions of Millicent Fawcett’s NUWSS and the Women’s Freedom League did more to earn the enfranchisement of Women. The Qualification of Women Act was passed in 1918, allowing female householders (or wives of householders), women with an annual household rent of at least £5, and female graduates of British universities to vote if they were over the age of 30. Thewlis, who had emigrated to Australia (where women had been granted the vote in 1901) before the outbreak of war, never saw the enfranchisement she fought for. She never returned to Britain, and died in 1976. Libby earned her feminist stripes interning for the Fawcett Society where she was horrified by most of the stories she heard. An accidental activist, she is a regular contributor to BCN, the UK’s only 100% bisexual publication. Her latest project, TreasuryIslands, is the home of her other passion – children’s literature. Libby is very proud of her bad reputation. While it may be often argued that the violence delayed success of the suffragist cause I have yet to see any real evidence of such other than wishful thinking that violence is never the answer. At worst it delayed it 6 years, and even that’s highly unlikely since there was little evidence of imminent success when the campaign began. Given that the organized movement for votes for women had begun in Britain a century earlier, that’s at most about a 5% slowdown, and probably closer to a 1% or 2% slowdown, with no guarantee that success would have resulted without it. The argument I’ve seen for why it may have worked is that the rational for most men to deny women the vote was chauvinistic in nature, rather than misogynistic. They were simply incapable of seeing women as political entities; they were mentally cast in the domestic sphere. Terrorist acts, even if they did not convince men of the righteousness of their cause, did cast them as political actors who had opinions about the public sphere. Had the argument been that women would use the vote badly it might have been less persuasive, but since the argument was that women weren’t the sort of people who cared about that sort of thing breaking the existing stereotype was instrumental in convincing people that women didn’t belong on an apolitical pedestal. I’m a Thewlis, I believe related to Dora. I’m a trade unionist, a FBU Official and am proud to be associated with Dora who stood up to be counted. More people need to get off their backsides and speak up about issues affecting so many in this country. As a 16 year old Dora had a sense of purpose, injustice and was compelled to show this. What a lass! Dora Thewlis, my hero, a true hero. Well said! A working class hero against all the odds; female, young, working class, and Northern. Here was a person wanting votes for all women not just ladies. Dora is my grandmother and I can assure all she remained a political activist to the end. The sacking of the Whitlam Government in 1975 promoted numerous family debates but no one stood stronger with the Labour cause than my octogenarian Grandmother who declared to my father that a vote for the Liberal Party would be a vote against everything your family has ever stood for. Strong to the end!